This to me is what Christmas Nails should be, None of those deep reds, classic purples or ghastly greens. 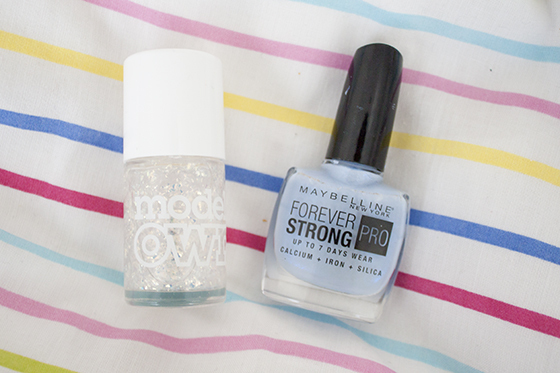 Just pretty soft icy blues and shimmering topcoats. Models Own Snowflake is a gold flake style polis. Flakie polishes are sort of clear glittery topcoats which have duochrome flakes in them, which give them a soft holographic feel to the nail. The flakies in Snowflake are silver toned but also pull gold in some lights, it's really gorgeous and looks amazing layered over all shades of base coat. Maybelline Ceramic blue is a long time favourite of mine, it dries super quickly, has a thick brush which is perfect for slick application. 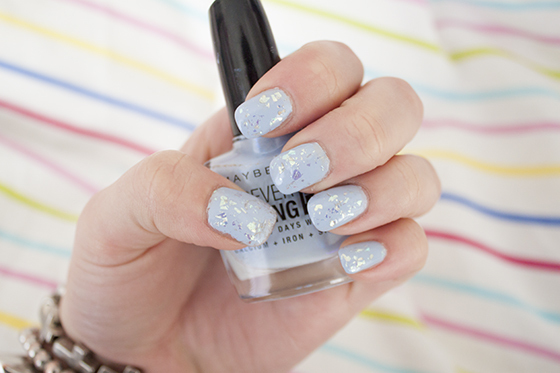 It's the perfect shade of cold blue which looks beautiful paired with Snowflake for soft ice cold nail look!